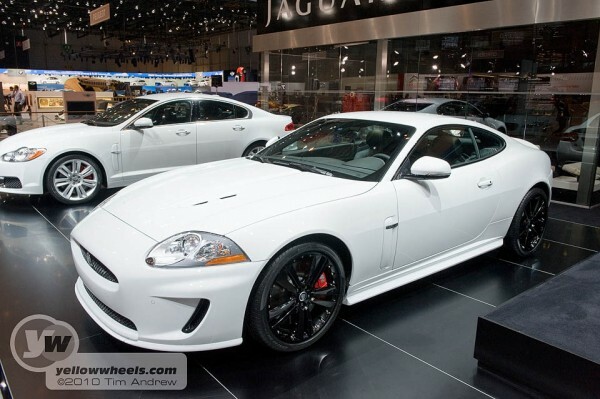 Geneva Motor Show - Jaguar XKR now a Supercar?! For a longtime now manufacturers have had a gentleman’s agreement to limit their high performance cars to 155mph/250kmh top speeds. This works well for containing the speed-one-upmanship that would otherwise break out between the makes and panders to the pressure to limit Germany’s speed-limit free motorways. But the XKR Jaguar has bees straining at the leash, dying to sprint beyond that artificial limit. Jaguar judge that the XKR, in its latest uprated form, is sufficiently specialist and powerful enough to warrant breaking out of its straight jacket. Indeed, they even refer to it as a supercar. If its new top speed of 174mph takes it into that territory, it had better have brakes and aerodynamics to match it’s new status. Painting the calipers red, and black chroming various addenda is not going to do it, so Jaguar have designed new front air dam/splitters and rear spoiler to keep it stable at high speed and fitted 20 inch rims. Let’s hope that the engine tweaks introduced to suit the new top speed haven’t affected lower speed tractability and usability. Although with 510PS and 625Nm of torque available we think that’s unlikely! 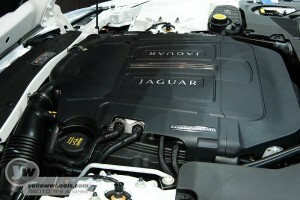 Jaguar unveiled the latest dramatic evolution of its supercharged XKR coupe at the Geneva Motor Show in March. This XKR delivers a significantly raised maximum speed – up to 174mph from 155mph – and bold styling changes that create an evocative and unique supercharged Jaguar. The XKR Coupe unveiled at Geneva showcases two new optional performance and styling packs – Speed Pack and Black Pack – that are introduced to the XK range at 2011 Model Year. Jaguar customers have the option to personalise their vehicle to create a car that offers even greater performance without compromising the refinement and luxury for which every Jaguar is renowned. The XKR Coupe featured at the Geneva Show on 4th March 2010 pairs both the optional Speed and Black Packs to create the bold new model, which also sports optional Piano Black veneers on the dashboard and red brake callipers. The XKR Coupe with new optional Speed Pack allows customers to further strengthen their XKR’s already impressive breadth of capability, by extending the car’s top speed from 155mph (250km/h) to an electronically limited 174mph (280km/h) thanks to a unique engine and transmission recalibration. To ensure the XKR with Speed Pack remains stable at high speeds, the coupe uses a revised front aerodynamic splitter and larger rear spoiler to provide increased balance and a reduction in lift. The XKR’s computerised Active Differential Control also adjusts to reduce steering sensitivity at very high speeds, further improving stability and driver control. 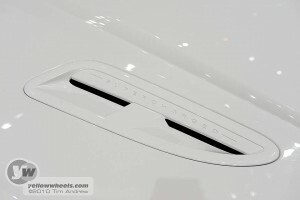 Every XKR with the Speed Pack will come with body-coloured side sills and rear diffuser, and a chrome finish to the window surrounds, upper and lower mesh grilles, side Power Vents and boot lid finisher. Red brake callipers with a Jaguar ‘R’ logo sit inside 20-inch Kasuga alloy wheels. Customers who order the XKR Coupe with the Speed Pack will be offered a paint palette that is part of the Jaguar Designers’ Choice programme – a range of colours that have been specifically chosen to compliment the performance potential of the car. Seven colours are available on Speed Pack models – Ultimate Black, Polaris White, Salsa Red, Liquid Silver, Lunar Grey, Kyanite Blue and Spectrum Blue. For customers looking to create a real statement with their Speed Pack XKR Coupe, the new optional Black Pack allows them to own a bold and purposeful Jaguar with undeniable visual impact thanks to menacing gloss black wheels and exterior detailing. Available only with the Speed Pack, XKRs fitted with the Black Pack have a paint palette selected from colours that Jaguar’s Design team believe to be ideal for creating a coupe with immediate exclusivity. The Black Pack models will be available in Ultimate Black, Polaris White or Salsa Red and boast eye-catching 20-inch gloss black Kalimnos alloy wheels. Further gloss black finishing is applied to the window surrounds and front grilles. Red painted brake callipers contrast strongly with the black alloy wheels, while body coloured front and rear spoilers and boot lid finisher round out the package. Customers also have the option to apply a sweeping ‘XKR’ side body graphic that runs along the door sills. Jaguar’s Design Director, Ian Callum, says the new Black Pack is a fitting addition to the XKR: “While Jaguars are about beauty, they are also about speed and power. With the optional Black Pack you can now add a sense of drama and severity to that performance.” In addition to the Black Pack’s exterior changes, the Jaguar Designers’ Choice programme has also selected a range of interior trims that support the visual impact of the car. All XKRs with the Black Pack will be trimmed with Charcoal leather hides that can be personalised with a range of colour stitching and grain. Three interior finishes and veneers for the fascia and door trims are also available – Dark Oak, Dark Mesh Aluminium and Piano Black. To underline the XKR’s sporting credentials at 11MY red brake callipers become standard on all XKR Coupe and Convertible models. 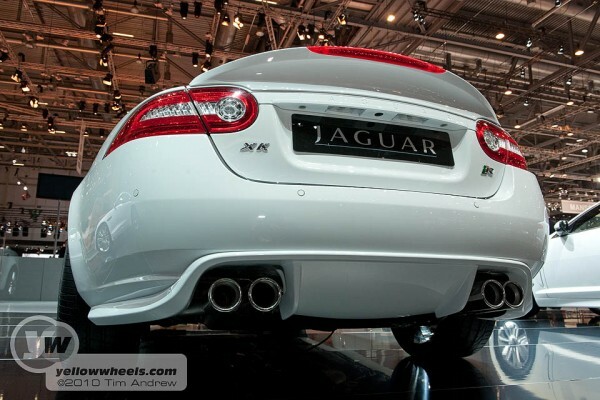 A tyre repair Instant Mobility System (IMS) becomes standard on all XK and XKR models. This frees up the 30-litre wheel well, which is now carpeted and can hold a specially designed and tailored XK accessory suitcase, substantially increasing the versatility of the car. In the UK, retail pricing of the XK range starts at £61,955 for the 5.0 n/a V8 petrol. The Speed Pack costs £3,500 and the Speed and Black Pack costs £4,000. Both are available on XKR Coupe only. For more information go to www.jaguar.co.uk.